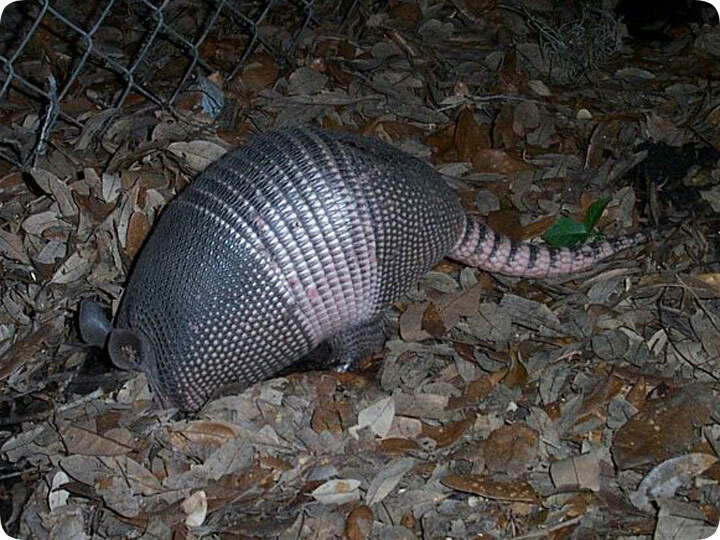 06.27.2003 - The Nine Banded Armadillo, Dasypus novemcinctus is not native to North America, including the two states in which it most thrives, Florida and Texas. The mammal is originally from south/central America. However, it has been transplanted to the states, and it survives just fine here. Rumor has it that the species was introduced to Florida in the early 20th century when two armadillos escaped from a small zoo. Who knows. Usually, exotic, or non- native species end up establishing populations in suitable habitats, because people inevitably transport the animals. In the case of the Nine-Banded Armadillo, Florida turns out to be an ideal environment - there's plenty of food, it's warm enough, the soft soil is easy to dig, and there are no significant natural predators. Even though armadillos are non-indigenous, I don't think they're harmful at all. They don't breed quickly, they don't spread disease, they don't kill any existing animals, they don't really compete much for territory with existing animals, they don't destroy crops, and so on. The primary nuisance actually seems to be in the suburban environment, when they dig tunnels under homes or other manmade structures. I took the above photo of an armadillo digging in the dirt, in search of earthworms or grubs. Armadillos are alert at times, but at other times, I can sneak right up and photograph them. They're so busy rooting around for food that they ignore their surroundings. No big deal, if in trouble, their tough hides will save them from attack. When Do Florida Armadillos Give Birth? The birth cycle of the armadillo is one of the strangest to be found in nature, and with the one embryo splitting off to give every female armadillo four babies, it is easy to predict how many animals will be born. As well as being quite strange in the way that these babies develop, it is also interesting that the female will actually hold the fertilized egg for quite some time before allowing it to develop. This is to help ensure that the baby armadillos are born at the right time of year to give them the best chance of success when they are born. The breeding season for armadillos will usually take place between June and July, and their gestation period is usually around four and a half months. The interesting thing about being able to delay the growth of the babies is that it allows the female to give birth in the spring, usually in March and April, giving her babies the best chance of survival. When the four children are born, their shells aren?t as solid as an adult?s shell, which means that they will often be with the mother for quite some time before they begin their own individual lives.